As the name of the post suggests, this “Roasted Eggplant Dip” is known as “Baba Ganoush” in Arabic. Similar to hummus, this roasted eggplant dip is a perfect blend of smokey eggplant, freshly squeezed lemon juice, plenty of garlic, tahini, and olive oil. It is quite popular not only in the Middle East but also throughout the world. You will notice that this dish is spelled in many different ways. This frequently happens when Arabic words are spelled out with English letters. 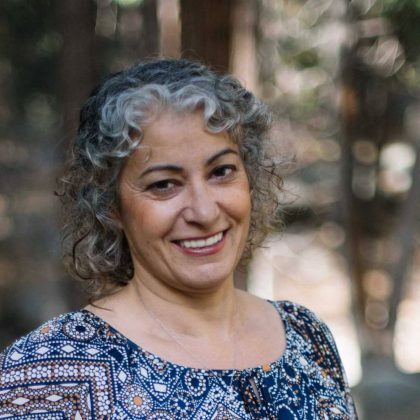 Some of the spelling variations include “baba ghanoush,” “babaganoush,” and “baba ghanouj.” I’ll be using the names interchangeably. As far a the meaning of baba ganoush, the word “baba” means “father” in Arabic. “Ganoush” on the other hand, means pampered. So I supposed if you want to pamper your father, make him some baba ganoush. Is baba ganoush good for you? When I think of the word “dip” I automatically think “unhealthy.” Americans, myself included, are used to eating dips full of highly processed ingredients and fat. Having that in mind, this Roasted Eggplant Dip recipe wins by a mile when it comes to nutrition. For one thing, this dip is relatively low in carbs, yet high in fiber. It’s made with healthy, all natural ingredients, like eggplant, garlic, lemon juice, and tahini. As a result, you can indulge guilt-free. Straining the eggplant flesh helps to eliminate the bitter taste. What Are the Ingredients in Roasted Eggplant Dip? The main ingredient in any Roasted Eggplant Dip is roasted or charred eggplant. Makes perfectly good sense, don’t you agree? 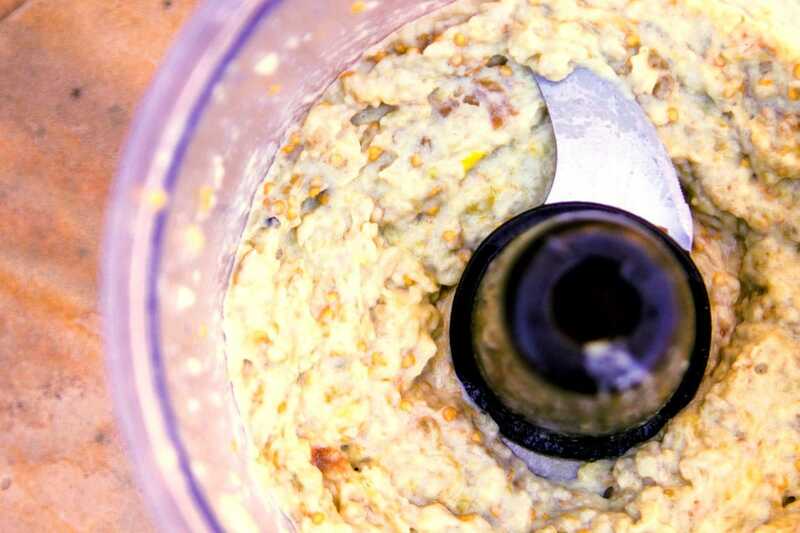 Some of the other ingredients found in baba ganoush include garlic, tahini paste, lemon juice, olive oil, and salt. Some recipes call for cumin, although as mentioned in other posts, I’m not a huge cumin fan, so I usually leave it out. Roasted Eggplant Dip is frequently garnished with parsley and olive oil. Other garnish ideas include roasted pine nuts, pomegranate seeds, and paprika. 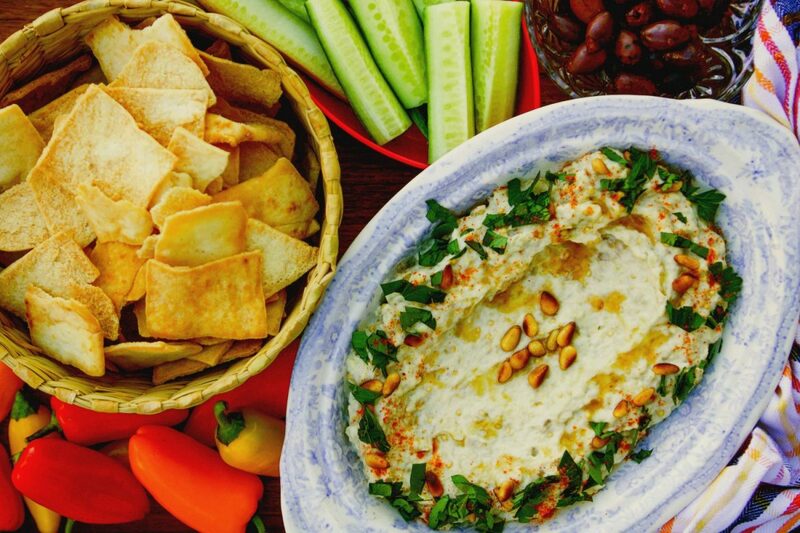 Serve this delicious dip with pita chips, or an assortment of cut-up vegetables. Make sure to use quick pulses when mixing the dip in a food processor. You want the dip to maintain some chunkiness instead of being too creamy. You may also like the following dip recipes: Hummus, Dill Dip for Veggies, and Mexican Bean Dip. Baba Ghanoush/Roasted Eggplant Dip. Yes, dip can be healthy and delicious! Slice large eggplant in half. Sprinkle with 1/4 tsp. salt. 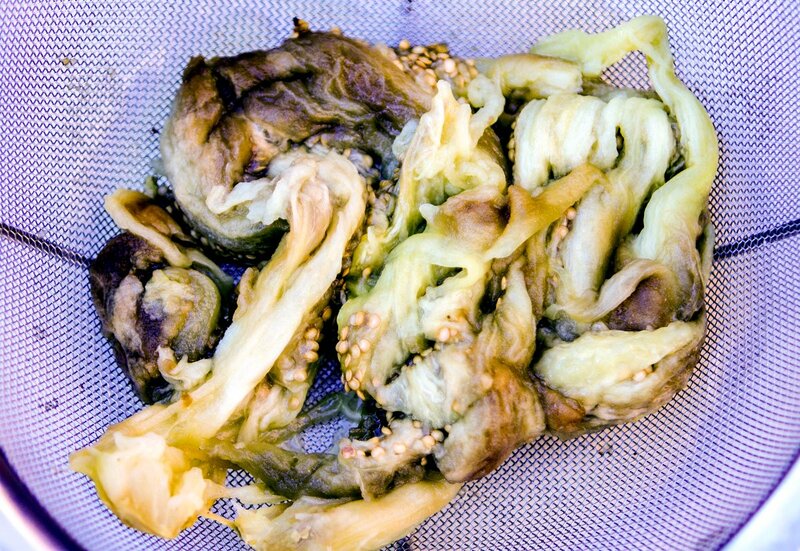 Place in a colander, flesh-side down and allow eggplant to sweat out the bitter juices for approximately 30 minutes. Rinse the salt off, they dry off with paper towels. Smear 1/2 teaspoon of olive on a foil-lined pan. Place eggplant flesh-side down on the pan. 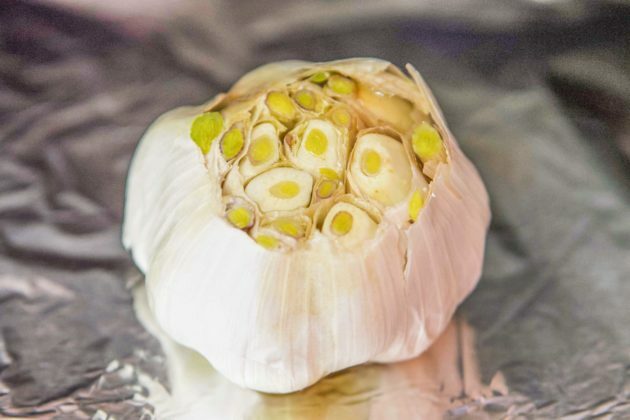 Add unpeeled garlic cloves. Pour 1 teaspoon olive oil over them. Place pan in the oven. 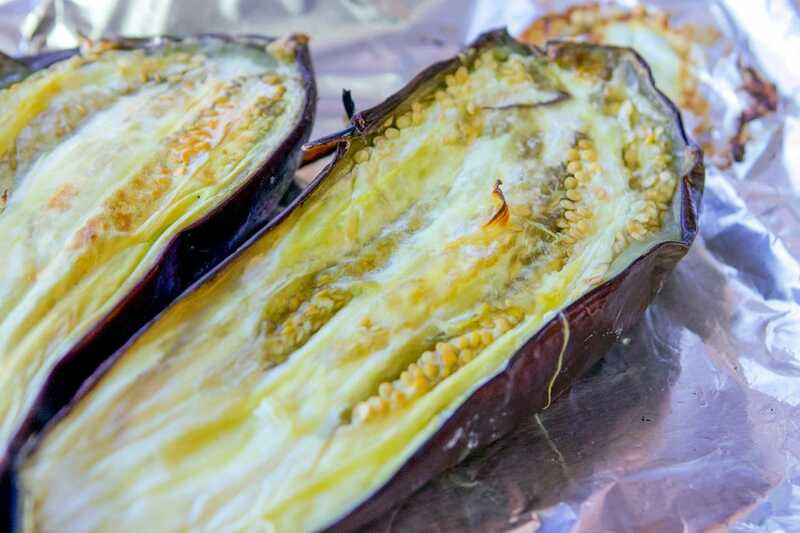 After 15 minutes, remove the garlic, and flip the eggplant over to the other side and cook an additional 15 minutes, or until slightly charred. When cool enough to handle, scrape the eggplant flesh away from the skin using a large spoon. Drain in a colander for a few minutes. Meanwhile, add the remaining salt, sesame seed oil, peeled and crushed garlic, tahini paste, lemon juice, and cumin (if using) to a food processor. Add eggplant flesh to the food processor, along with the other ingredients. Pulse a few times, to mix. Do not over-mix, baba ghanoush should have a chunky consistency. Plate the baba ghanoush and refrigerate until ready to serve. Before serving, drizzle with the remaining 1 Tablespoon of olive oil. Garnish with any of the following: chopped parsley, paprika/cayenne pepper, and toasted pine nuts.